Alternative housing is being made available for displaced Merrimack Valley residents who were affected by the explosions last month. The Baker-Polito Administration, Columbia Gas, MEMA and local officials announced housing assistance for Merrimack Valley explosion victims. Hotel rooms, apartments, travel trailers and shelters are being offered as an alternative for displaced residents. Residents interested in the housing program can call Columbia Gas' Claims line at 1-800-590-5571. An estimated 8,600 residents were evacuated following the Sept. 13 disaster that left one man dead and 25 others injured. Although many residents were given the OK to return to their homes, many returned to find that they would be without gas as crews work to restore 48 miles of pipelines through Nov. 19. "We are pleased to announce housing options, especially for our most vulnerable residents, to make this recovery process a little easier and provide essential services as the days get cooler," Gov. Charlie Baker said in a statement. The housing program was announced Friday by Baker's administrator, Massachusetts Emergency Management Agency, Columbia Gas, and Lawrence, Andover and North Andover community officials. It includes 3,000 hotel rooms, 360 travel trailers, 150 apartments and warming centers and shelters. Beginning Friday, affected residents will be able to participate in the housing program. 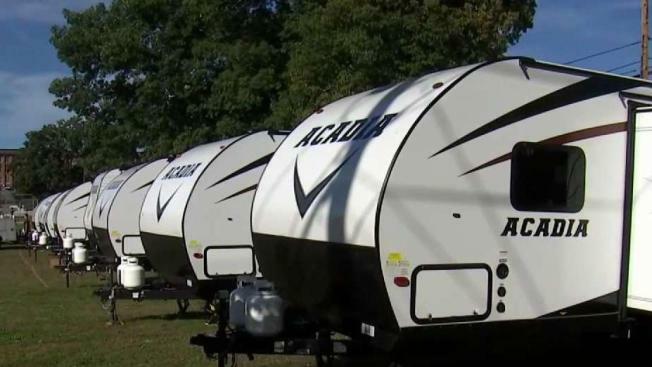 Apartments and hotels will be made available for customers who call Friday and travel trailers will be an option in the coming days, according to officials. In the meantime, shelters are open to use for hot showers or as an overnight option. Residents staying in apartments and hotels who do not have their own means of transportation will be accommodated, officials announced. Uber and Lyft services will be provided. Residents like Helen Morcelo, of Lawrence, describes her living situation on Andover Street as "a nightmare." With no heat and hot water since the disaster, she's been trying for weeks to relocate with her 86-year-old father who has cancer. "I'm like, 'why, what can I do just wait,'" Morcelo asked. Her home is one of many deemed not safe enough for a space heater. Morcelo said due to a 24-hour backlog for the newly announced housing assistance she's been placed on a list. Impacted residents who are interested in receiving housing assistance can call Columbia Gas' Claims line at 1-800-590-5571.